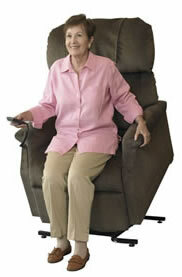 Our lift chair bot will find the perfect lift chair for your height and weight! Feeling confident buying a lift chair? Everything to Know About Lift Chairs is here or you can just give us a call! Only sell top brands made in the USA like Pride, Golden, and AmeriGlide. "My wife has ALS (Lou Gehrig’s disease) and under HOSPICE care, she will appreciate the new chair with plenty of room to lay back and rest and I will not miss the 2 x 4’s and broken handle; thanks again for all you help and patience with me making up my mind about the chair. Your company is fortunate to have you as an employee and should appreciate you and all you do. When it's all said and done a lift chair is a physical aid. 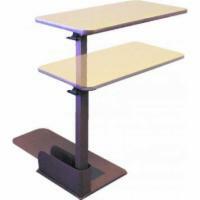 Its purpose is to make sitting or standing easier in all cases, and possible in many others. Comfort is the byword when considering a lift chair. We think that in most cases comfort should be the primary consideration. We're simply trying to make life a little easier for you. Easier to stand, easier to sit, easier to transfer from a wheelchair to a lift recliner, easier to get comfortable for extended periods, and easier to dose off when the notion strikes. With this in mind let's look at how a lift chair is constructed. The first lift chairs could be described as spring loaded lift recliners. And how much of a load would the spring have on it? Well that was a problem. Ever seen the cartoons where someone (or the family dog) is launched through the roof? That's an exaggeration, but you see where I'm going. Wasn't long before a scissor lift was invented to replace springs. It was powered by one or more electric motors, and controlled by a user operated pressure button that stops the lifting motion when released, allowing the operator full control over the lifting process. As you will see later in this guide, lift recliners are now comprised of a wide variety of specialized lift chairs for persons of every size and description. Because modern day lift chairs are so specialized it has become critically important to select one that specifically meets all of your personal requirements. The right size, the right capacity, the right look, the right options, and the right features. By doing a modest amount of homework you will discover a lift chair can be designed to conform to the right position for your body. They can be set to the correct angle for sitting or standing, correct length for your feet to rest, the correct position for your head rest, and some pillow back models can be set to the correct curvature for your back. And the list of personal comforts goes on for a considerable distance beyond that. Later in this article you will encounter a section that describes each type of lift chair, and how their characteristics can be suited to your expectations. We suggest reviewing this section closely to insure that you receive, with the purchase of any lift chair recliner, what you expect. Another notable improvement is the addition of battery backup. A battery backup allows a chair to be operated no more than a few times without wall power, but if you need a lift chair the chances are good you will have a problem getting out of it without power in an emergency outage. Today lift recliners all come with battery back up. We often get requests for lift chairs with swivel bases and rockers. It is virtually impossible to maintain a high level of safety and dependability if you compromise a lift chairs frame. As you would suspect, the frames are specifically designed for stability. Imagine a lift chair with a swivel for a moment? Up, up, around, and out to the floor we go. OK, just a little humor never hurts. Lift chairs are not available with rockers, or swivel bases. Modern lift chairs have evolved to such an advanced state that senior citizens without disabilities are purchasing them just for increased comfort. I'm no spring chicken, and I have already discovered that most mornings when I get up everything hurts. It's just simply nice to press a button and get into, or out of, an easy chair without taxing your back, legs, and upper arms. I can't imagine how important it could be for a person with inflamed joints. Call us at 1-800-880-2514, describe your physical characteristics, and your personal desires for added comfort. Our lift chair specialist will help you select one that is right for you. We would be remiss if we didn't address price at the top of our list of reasons to buy a lift chair on the Internet. In this economy it makes all the more difference to get a good deal. And the best deals are on the Internet. We ship every lift recliner chair directly from the factory, use far less overhead than a street dealer, and pass the savings directly to you. In addition, you pay no sales tax when you buy from an Internet dealer. Internet dealers such as Lift Chairs 101 contract directly with the factory to service your electric lift chair. If you have warranty work or a need for a repair the factory contacts their local representative in your area for service. You may also take your chair in to a local repair shop authorized by the factory. If your local dealer goes out of business the factory simply sends another one to service your needs. You never need to worry about the availability of service or warranty work. If you go to a local dealer you will see only a few examples of lift recliner products. When you enter our site you will see every lift chair offered by every dealer we represent. When you place an order it is processed the same day you make your purchase, meaning that delivery will be as prompt as you could expect anywhere. Every size, color, and model is available immediately for your review. Let us think for a minute about what constitutes expertise. We think expertise comes from good old fashioned experience. Experience only comes from selling lift chairs, and we sell many times the number of lift chairs as the average street retailer. Our lift chair specialists sell lift chairs only, 18 or more hours per day, every day of the week. We have encountered every conceivable variety of special needs, and requirements, over and over again many times. All you need to do is ask the questions to determine for yourself that the most qualified advice will come from a specialist at an Internet dealer like Lift Chairs 101. Compare our advice with that you receive from a book dealer or large drug chain. The result will speak for itself.